St. Kitts Marriott Resort & Royal Beach Casino captures the many moods of one of the most relaxing and romantic Caribbean Islands. This incredible resort offers an unparalleled island vacation experience. The luxury guest rooms, trimmed with West Indian accents and cutting-edge comforts, are spacious and welcoming. That same Caribbean flavor sets the tone in our 8 restaurants and 3 lounges. For those who enjoy games of chance, the resort offers the 35,000 sq ft Royal Beach Casino - one of the largest and most luxurious Caribbean casinos. The spacious Emerald Mist Spa includes men's and women's saunas, hot and cold tubs, and relaxation lounges that will relax and revitalize your soul. 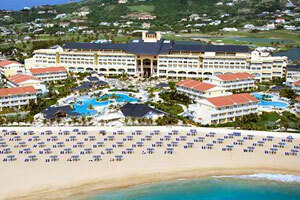 The resort boasts a championship golf course at the Royal St Kitts Golf Club. Whether you are hitting the links or splitting aces, easing your mind or pleasing your palate, you'll find just what you need for an inspiring St Kitts vacation at the St Kitts Marriott Resort & Royal Beach Casino.